Taking into account feedback regarding their current Greek yogurt offering, the folks at Yoplait will be coming out with a new Greek Yogurt this August. Customers weren't big on the previous fruit on the bottom and aftertaste of the current stuff, so the fruit is now blended into the yogurt and they've tried to eliminate the aftertaste. I was offered the opportunity to sample the new yogurt pre-launch and received several 5.3-ounce cups in the mail courtesy of Yoplait. The suggested retail price will be $1.29 a cup. Boston Market is offering a Fourth of July half-off deal. The promotion is only valid this upcoming Thursday, July 4, and is good on any Family Meal purchase at participating Boston Market locations. 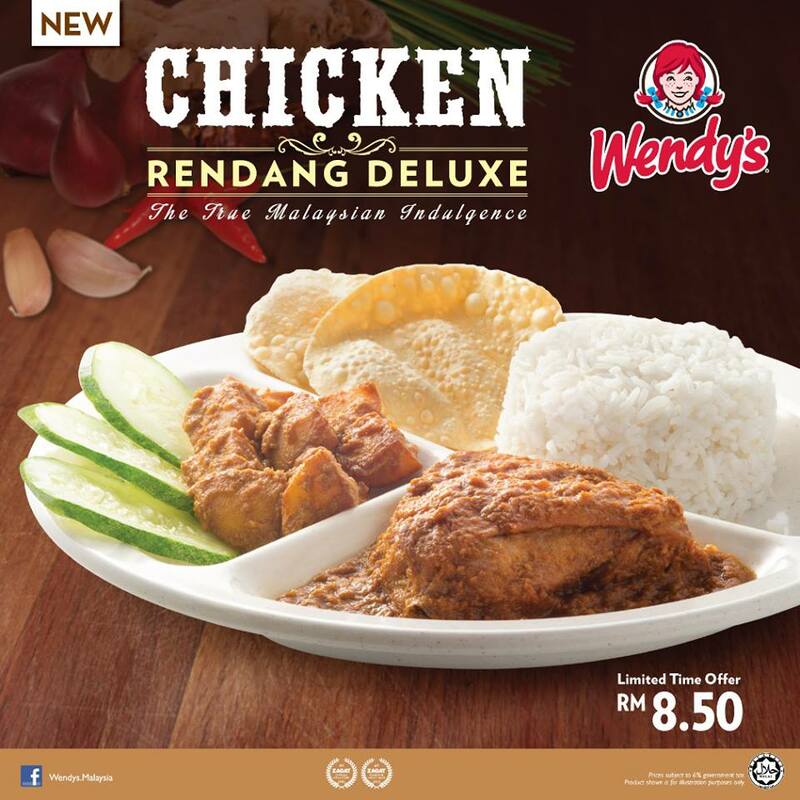 In a localized twist, Burger King Singapore combines their burgers and crispy chicken sandwiches with rendang for new, limited-time Rendang Burgers. Rendang is a meat-based sauce made with coconut and a paste of ground spices. Due to mixed response regarding their change from white rice to brown rice as the base for their fried rice, Panda Express looks to customers to decide whether Classic (white) Fried Rice or new Brown Fried Rice will remain on the menu come September. Wendy's Strawberry Lemonade is their All-Natural Lemonade with strawberry puree added. A large 32-ounce cup of lemonade is $2.49 and an extra 50 cents for strawberry puree brings the total to $2.99. For whatever reason, KFC restaurants here in the States don't offer French fries. However, up north in Canada, KFC and even Taco Bell serves French fries. 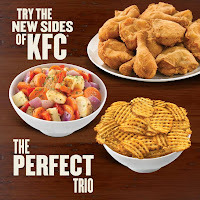 Now, KFC Canada even serves new Waffles Fries, along with new Harvest Vegetables. I guess Waffle Fries are sorta like Potato Wedges, and we get those... Also, they offer gravy but not mashed potatoes (it's for the fries... I think). Similar to last month, Jamba Juice is once again offering a limited-time "buy, one, get one free" deal on any of their smoothies through Monday, July 7, at participating locations. Jose Ole Spicy Shredded Steak and Cheese Nacho Bites features red corn tortilla folded into triangles and filled with shredded steak, cheese, green chiles, jalapenos, and seasonings. A 16-ounce box was on sale for $4.99. 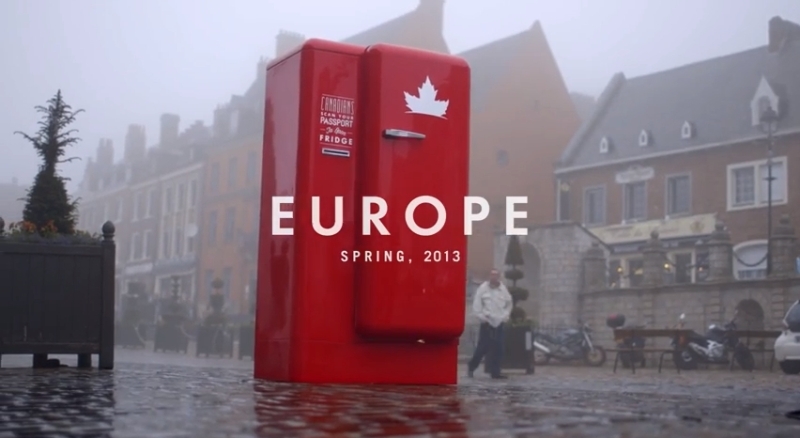 How do you increase your country's popularity abroad in one fell swoop? With beer of course! 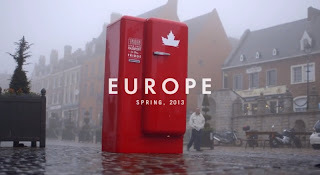 Molson Canadian had the brilliant idea of putting fridges (in Canadian red of course) full of beer at select locations all over Europe. The catch being they could only be opened by scanning a Canadian passport. Burger King's Australia branch, Hungry Jack's (named after the Pillsbury pancake brand because "Burger King" was already trademarked by another company in Australia), recently introduced a limited-time, spicy-themed "Angry Menu," which features the familiar Angry Whopper (as well as a chicken and veggie version), but also a Chili Choco Sundae. The Valencia Orange Starbucks Refresher is the newest member of the Starbucks Refresher line and features the taste of Valencia oranges and Clementines plus a slice of Navel Orange for garnish, along with green coffee extract for a hit of caffeine. A 24-ounce Venti cup is normally $3.95, but I picked this one up for $1.97 during the half-off promotion this week. 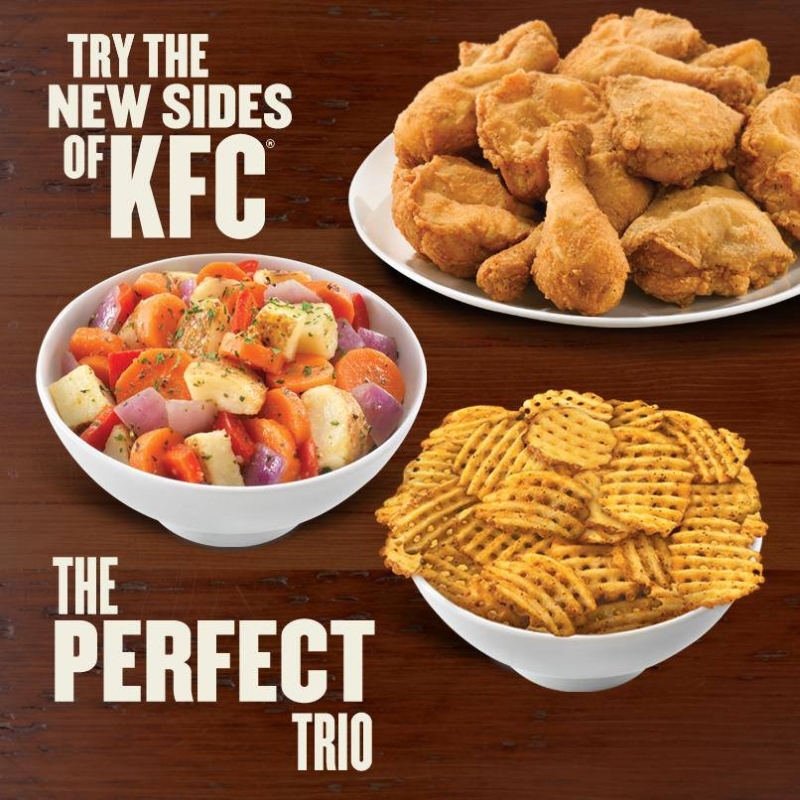 Over in Japan, KFC offers a fancier line of foodstuffs they call "Colonel's Dish." 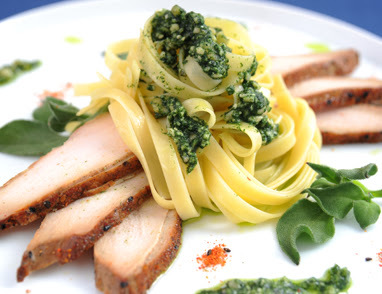 It was initially launched in December of last year with a chicken terrine (like pate but even fancier) and ballotine. The Colonel's Dish line comes cold and can be served as is or incorporated into a fancy dinner plating. They're only available at a select number of KFC restaurants in Japan. Carnitas is back on the menu at Del Taco for a limited time and in addition to being available in tacos and burritos, the seasoned braised pork can also be found on fries. They're calling the new dish "Loaded Carnitas Fries and it features crinkle-cut French fries topped with carnitas, shredded cheddar, chopped cilantro, and diced onions. 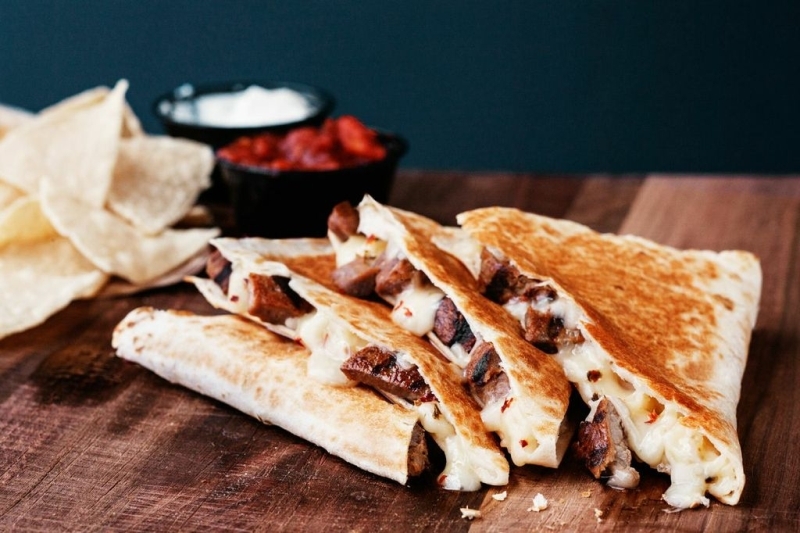 Taco Bell's newest addition to the more upscale Cantina Bell menu is the new, limited-time Cantina Double Steak Quesadilla. It features a double portion of thick-cut, marinated steak with pepper jack cheese folded inside a flour tortilla and then pressed/grilled. The Cantina Double Steak Quesadilla also comes with tortilla chips on the side as well as sour cream and new fire-roasted tomato Cantina salsa for dipping. 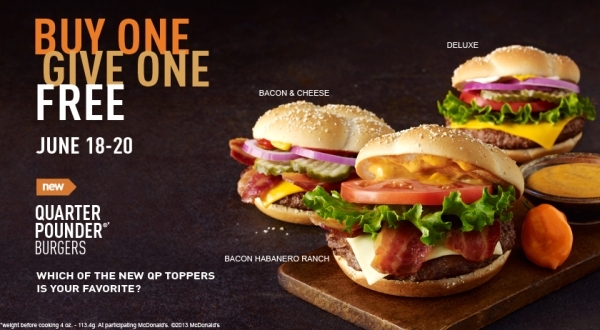 The 1/4 pound replacement to the departed Angus burger with the same descriptor, McDonald's new Bacon and Cheese Quarter Pounder comes with the same toppings, but with a different bun and hamburger patty. Those toppings are a slice of American cheese, bacon, ketchup, mustard, crinkle-cut pickles, and red onions. It's $3.99 for the burger. Popeyes returns Zatarain's Butterfly Shrimp for their latest limited-time menu item. The dish features the combination of Popeye's regular menu Butterfly Shrimp with the seasoning of Zatarain's and a distinctive cornmeal breading. Starbucks will be promoting their green coffee extract-based Starbucks Refreshers by offering them for half-price from 3-5pm starting this Thursday, June 27 and running through Saturday, June 29. Jack in the Box's Big Waffle Stack is part of their summer "Go Big or Go Hungry" menu and features two eggs, country-grilled sausage, ham, American cheese, and hickory-smoked bacon between two lightly-sweetened, toasted maple waffles. Like the rest of Jack's menu, it's available all day. It cost me $3.39 for one at my local Jack in the Box. 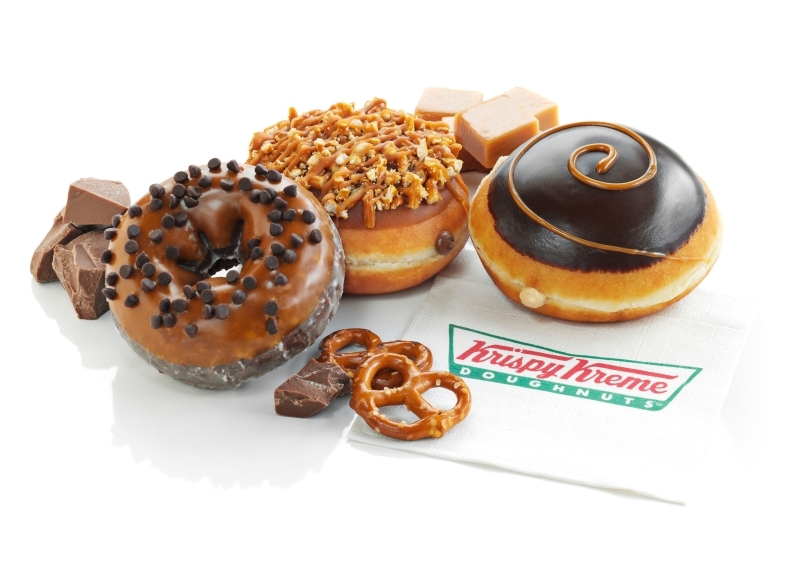 Krispy Kreme introduces new Caramel and Chocolate Shop Donuts with three new, limited-time donuts and featuring key ingredients of chocolate, caramel, and salted pretzels. With various chocolate and caramel combinations, the selection includes Caramel Chocolate Chip Cake, Caramel Chocolate Pretzel, and Dark Chocolate Caramel Kreme. Wendy's might have their vaulted Pretzel Bacon Cheeseburger, but Sonic is going with new, limited-time Pretzel Dogs this summer. Citing the "the age-old summertime dilemma of hot dog versus pretzel" at the ballpark, Sonic now offers the Cheesy Bacon Pretzel Dog and Original Pretzel Dog as a solution. Chipotle is offering/testing "Sofritas" as a vegetarian-friendly tofu option here in California. It's made with shredded Hodo Soy brand organic tofu braised with chipotle chilis, roasted poblanos, and spices. It's $6.25 for a bowl at my local Chipotle and they'll build it however you like. I like to load it with fajita veggies (onions and bell peppers) and salsas, plus extra rice. It ends up being a pound or more, which is sometimes a whole day's worth of food for me. Starbucks offers three new drinks for the summer with new Valencia Orange Refreshers, Orange Spice Iced Coffee, and Shaken Iced Peach Green Tea Lemonade. Valencia Orange Refreshers are made with real fruit and fruit juice plus green coffee extract for a hit of caffeine. They feature the taste of Valencia oranges and clementines along with notes of jasmine, cardamom, and apricot. It's garnished with a slice of naval orange and is also available in instant Via form. A 12-ounce Tall is 70 calories. Wendy's debuts the new, limited-time Pretzel Bacon Cheeseburger starting today (with a staggered release that will see all Wendy's restaurants carry the burger by July 4). The burger features a warm, soft pretzel bun sandwiching a 1/4 lb hamburger patty, Applewood-smoked bacon, a slice of cheddar cheese, warm cheddar cheese sauce, smoky honey mustard, tomato, red onion, and spring mix. The price tag on the burger is $4.69 (may vary). Jack in the Box recently introduced new Iced Coffee in Mocha and Original flavors and I recently tried the Original version. It's basically their Premium Roast Coffee with sweetened cream over ice. A 16-ounce "regular" cup cost me $1.99. 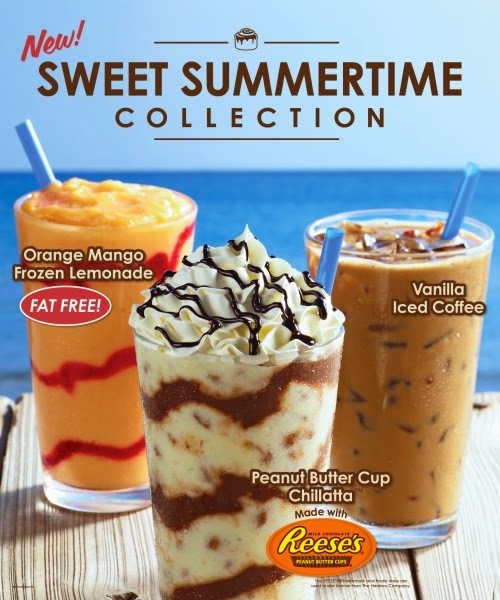 Cinnabon is offering a seasonal summer line up of three beverages, including a new Reese's Peanut Butter Cup Chillatta. They're calling it "The Sweet Summertime Collection." The promotion aims to offer a little something for everyone this summer with a chocolate option, a tangy, fruit-flavored option, and a coffee option. 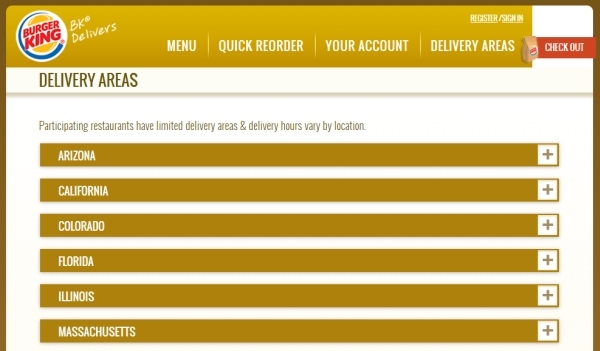 Burger King's "BK Delivers" delivery service has now set up shop in Boston, which brings the count of metropolitan areas offering the service to 12 (other areas include New York, Miami, Houston, Los Angeles, Chicago, San Francisco Bay Area, Las Vegas, Sacramento, Washington, D.C., Phoenix, and Denver). To welcome in the summer, Nabisco recently introduced new, limited-edition Watermelon Oreo cookies exclusively at Target. The cookies feature a watermelon-flavored creme filling, colored pink and green, sandwiched between two Golden Oreo wafers. A 15.25-ounce package costs $2.99. 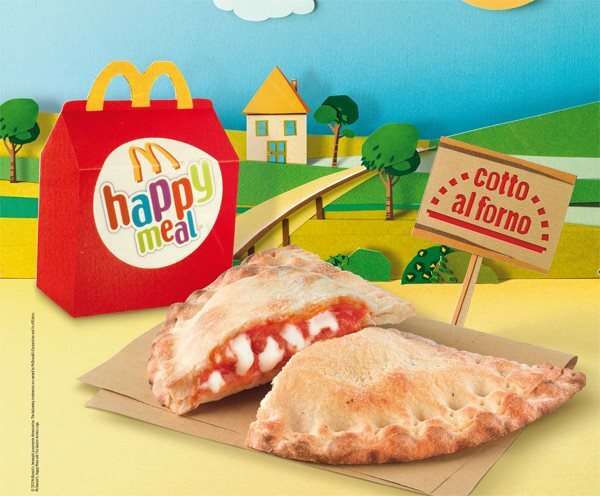 McDonald's Italy looks to sell Italian food to the Italians with a new calzone they're calling the Pizzarotto. The name is apparently a portmanteau of "pizza" and "panzarotti/panzarotto," which is basically a small version of a calzone that may be deep-fried or baked. As more of a light entree, the Pizzarotto can be purchased individually or as part of a Happy Meal. Each Pizzarotto comes filled simply with tomato and mozzarella. 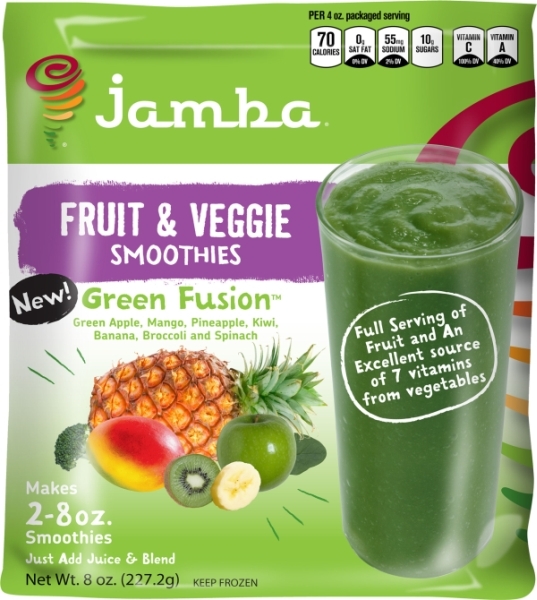 Jamba Juice adds some green to the frozen food aisle with new Green Fusion fruit and veggie "at-home" smoothie kit, manufactured by license by Inventure Foods, Inc. 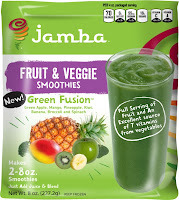 The new flavor features a mix of green apple, mango, pineapple, kiwi, banana, broccoli, spinach, and spirulina. Fruttare Strawberry and Milk Frozen Dessert Bars are pretty self-explanatory. They're mostly milk, strawberries, sugar, and water frozen into a popsicle. A box of four 2.7-fl oz bars typically costs about $3, but I received these courtesy of Unilever. 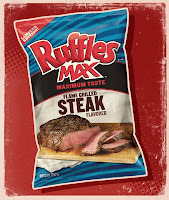 Frito Lay introduces new, limited-edition Flame-Grilled Steak-Flavored potato chips to their Ruffles Max line. 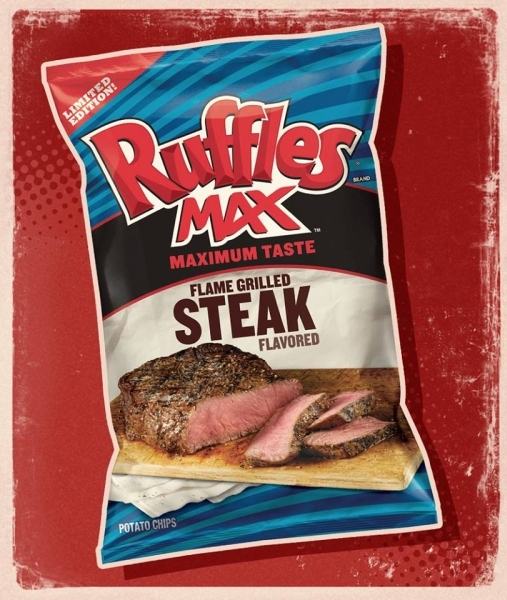 The Ruffles Max line is aimed at the male demographic and features flavors like Beer Battered Onion Rings and Smokehouse Style BBQ. The new Flame-Grilled Steak-Flavored potato chips are described by Frito Lay as "like a steakhouse in your mouth— minus the obnoxious maître d’, weird tiny salad forks and soft jazz." Carl's Jr. brings back the Cranberry Apple Walnut Grilled Chicken Salad and introduces a new BBQ Ranch Grilled Chicken Salad. When it was first introduced in 2009, Carl's Jr. tapped Kim Kardashian to appear in the Cranberry Apple Walnut Grilled Chicken Salad's television ad. This time around, it's up to Jenny McCarthy to sell some salad. McDonald's Dulce De Leche Shake is a new seasonal shake they're serving through September. It's essentially a caramel shake and features reduced fat vanilla ice cream blended with a "dulce de leche shake syrup", swirled with caramel sauce, and topped with whipped cream plus a maraschino cherry. A 12-ounce small goes for $1.89 around here, but I received this one courtesy of McDonald's. P.F. 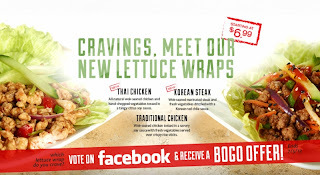 Chang's fast casual arm, Pei Wei Asian Diner, is offering a "buy one, get one" offer on their new Lettuce Wraps. 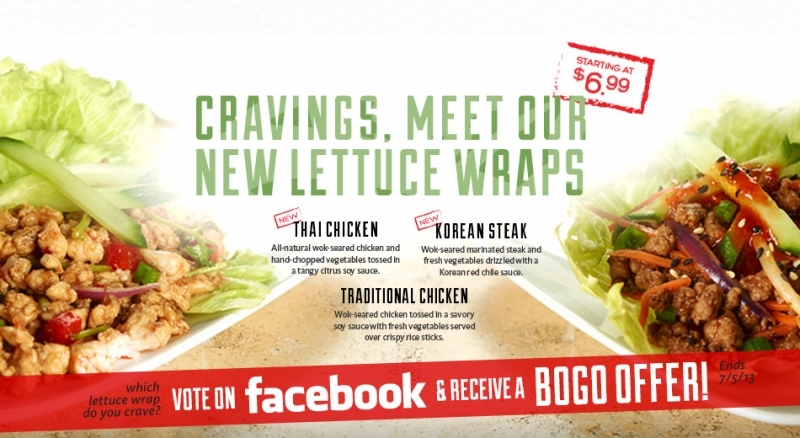 You can take advantage of the offer by "liking" the Pei Wei Facebook page and voting on which of Pei Wei's Lettuce Wraps you prefer. Pepperidge Farm's Goldfish cracker brand is branching out into other carbs with new Goldfish Mac & Cheese. 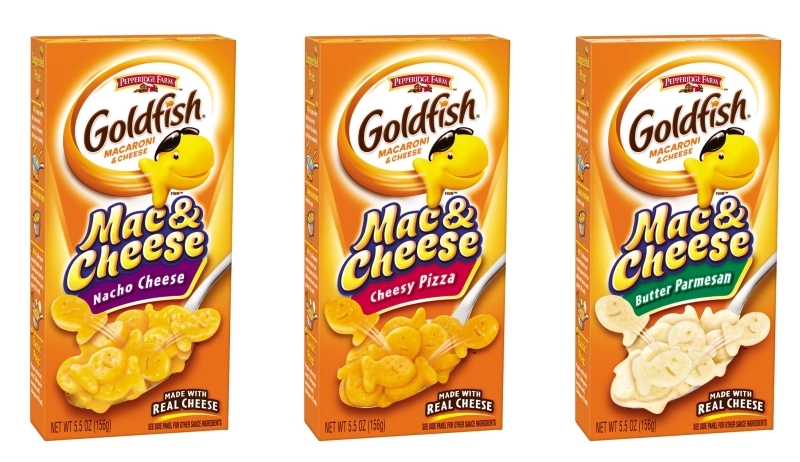 Made with Goldfish-shaped pastas, Goldfish Mac & Cheese comes in four varieties: Cheddar, Nacho Cheese, Cheesy Pizza, and Butter Parmesan. Each box is made with real cheese sauce and contains no artificial preservatives. Starting this Friday, Papa John's will be offering a "50% off any pizza" deal good online only, and valid at only at participating Papa John's locations in Southern California, including Los Angeles, Orange County, Ventura, San Bernardino, and Riverside Counties. 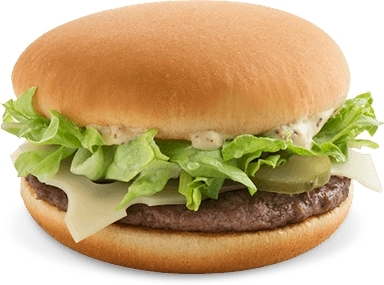 McDonald's "new" Quarter Pounder Deluxe is the replacement for the departed Angus Deluxe and features the same American cheese (but only one slice instead of two), tomato, leaf lettuce, red onions, crinkle-cut pickles and mayo. Different are the bun which is the same bun as their premium chicken sandwiches and the patty, which is the same quarter pound of beef you'll find on the Quarter Pounder. These cost $3.99 each in my area. While some burger chains, notably In-N-Out, offer their burgers in a "low-carb" configuration, Taco Bell hasn't really explored the option until recently with the bowl option of their Power Fresco Menu test in a few Southern California location. 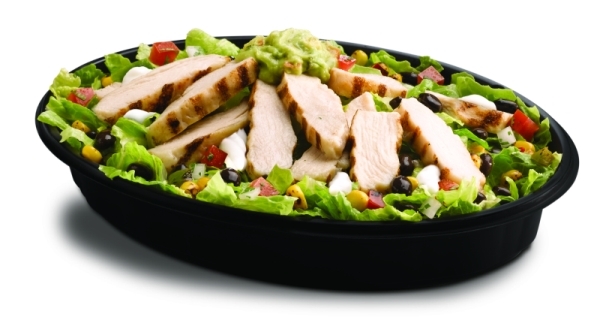 The menu is part of Taco Bell's efforts to include more better-for-you options and features a lower calorie, more protein theme. It looks like the test did well (or at least well enough) and they'll be doing a small market test out in Dayton, Ohio starting July 25, 2013. Embracing the Japanese love of limited-time items, Krispy Kreme Japan offers the exclusive limited-edition Matcha Red Bean Donut, which is available at all of one Krispy Kreme location in Japan. 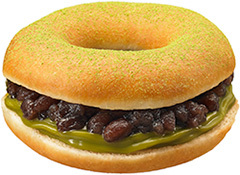 The donut features a Krispy Kreme Glazed Original Donut split in two, filled with matcha green tea cream and sweet red beans, and dusted with matcha green tea powder. It's only available through July 9th at the JR Takashimaya Krispy Kreme store in Nagoya. Pizza Hut's new Firebaked Style Flatbread Pizzas feature a "slightly crispy 'wood-fired style' crust and come six single-serve rectangular pizzas in a lengthy 2-feet-long box for $11.99. 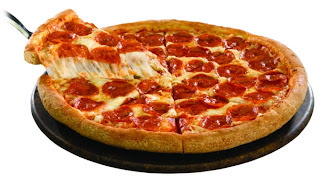 You can choose up to three different topping combinations of up to three toppings on the six pizzas. I went with pepperoni; pepperoni and sausage; and chicken, green bell peppers, and onions. There's a good amount of pizza to fill the floor of the box, but they don't quite cover the length of box and leave a noticeable gap. 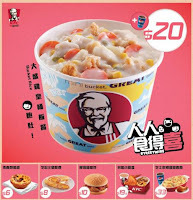 While KFC is known for their iconic bucket of chicken, it looks like they're trying something else in a bucket over in Hong Kong: rice. Not just any rice though, but specifically Chicken a la King... in a mini bucket. 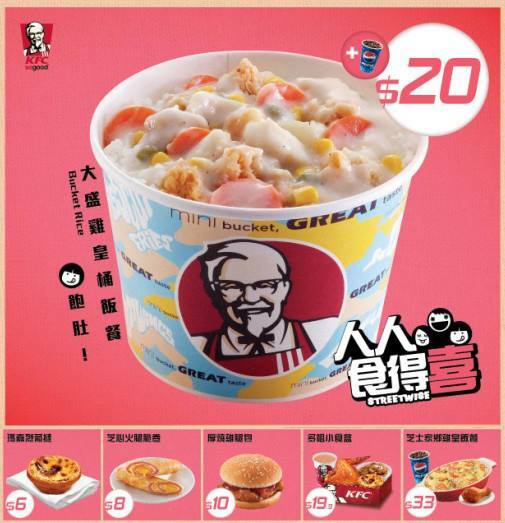 They're calling it Bucket Rice and it's part of KFC Hong Kong's "Streetwise" value menu. Inside the mini bucket, there's sliced fried chicken and mixed vegetables (corns, carrots, and peas) in a creamy sauce over rice. The price isn't bad at all at $20 HK (~$2.85 US). 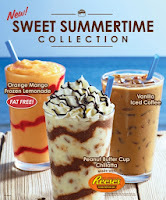 In case you want a half-price shake from Sonic but don't want to wait until after 8pm this summer to get one, Sonic is celebrating the Summer Solstice, the day before on Thursday, June 20, by offering half-price shakes all day long. Jack in the Box's Jack's Big Stack burger is stacked with two jumbo beef patties, American cheese, pickle slices, onion rings, mustard, and mayo onion sauce on toasted sourdough. My local Jack in the Box offers them at $4.49 a piece. 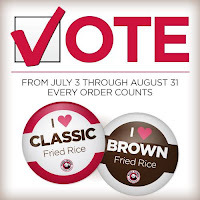 They also have a coupon on the Jack in the Box website for $1 off that doesn't expire until the end of July. 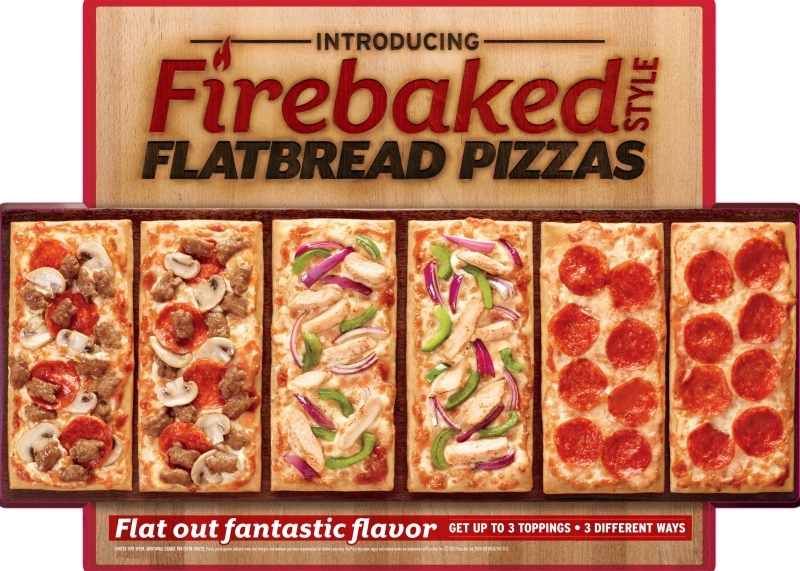 Pizza Hut unveils their newest crust option with new, limited-time Firebaked Style Flatbread Pizzas. The Flatbread Pizzas are available to order in a box of six and, similar to the previous Pizza Sliders, can be topped in three different ways, with up to three toppings each. An order costs $11.99. McDonald's entices you to try their three new Quarter Pounder burgers by offering a "buy-one-get-one-free" offer on Quarter Pounders starting tomorrow, Tuesday June 18, and running until Thursday, June 20, at participating locations. 7-Eleven's French Vanilla Iced Coffee is a mix of coffee, sugar, milk, plus artificial and natural flavors in a chilled pre-mix. You just add ice in a cup and fill it yourself similar to a soda fountain. It's described as "light" and "sweet" on the 7-Eleven website. 7-Eleven is currently running a promotion where you can buy a 16-ounce medium cup for $1 (normally about $1.59). McDonald's is looking to expand the Dollar Menu with new "Dollar Menu & More." The new menu expands the menu with some new burgers and new variations on current value burgers like the McChicken and McDouble. Most menu items range from $1 to $2. 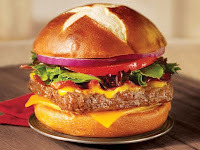 Notable new items include the Dijon Swiss Burger and the Southwest Burger, while new versions add bacon or tomato and cheese to value-priced chicken and burger platforms. The menu also includes current Dollar Menu items such as the McChicken, soft serve cones, and the Cheddar Onion Burger. Grill 'Em All's Primate Fries are their take on In-N-Out's Animal Fries. The key differences are shredded cheddar cheese instead of American cheese and the fries themselves. The grilled onions and Thousand Island dressing remain the same. 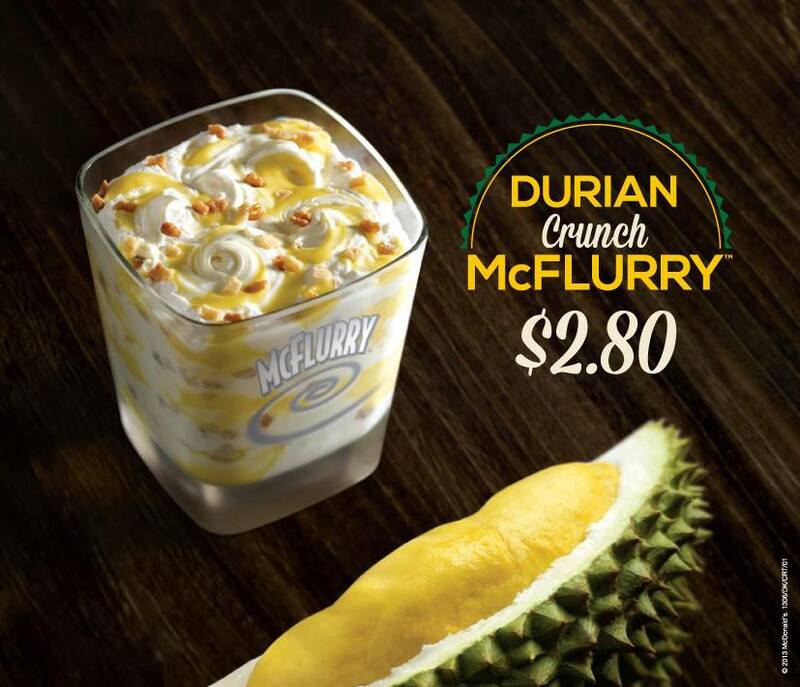 McDonald's Singapore makes an interesting move for a fast food chain of general appeal by incorporating an extremely polarizing fruit into their latest, limited-time McFlurry, the new Durian Crunch McFlurry. For those of you who have never heard of or encountered the durian fruit, it is an extremely pungent large fruit with a spiky shell that would not look out of place as the head of a mace. 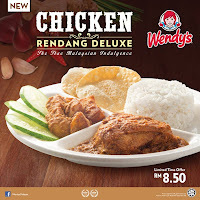 In what may be an example of a truly localized dish from a major fast food chain, Wendy's Malaysia offers new Chicken Rendang Deluxe, which is basically a fast food version of the local dish of the same name (sans the deluxe). Rendang originates from Indonesia and is popular among several countries and Southeast Asia. It's a type of heavily-spiced curried meat dish that's been reduced so that there's not much liquid remaining.